On March 14, we shared information about our work to remove bad ads and bad sites from our ad networks. With a combination of people, policies and technology we took down more than 3.2 billion ads in 2017, up from 700 million in 2015. That’s more than 100 bad ads per second. Today, we want to share more details about how our policies and policy enforcement work to help protect our network. We continuously monitor ads and content for policy compliance. If you’re an advertiser, our AdWords policies determine which ads are acceptable and what types of products or services can be promoted with Google ads. For example, we prohibit technologies that attempt to deceive users or abuse our network, like auto-redirecting ads, malware-laden sites, or “trick-to-click” ads. If you’re a publisher, our AdSense program policies outline the kinds of websites and content we allow to show Google ads. For example, our dangerous and derogatory content policy prohibits publishers from running Google ads on content that promotes discrimination against marginalized groups. We constantly review and update our policies to protect consumers, advertisers and publishers. In fact, in 2017, we added 28 new advertiser and 20 new publisher policies. To enforce these policies, we use a combination of people and technology. Google’s technology is designed to detect when ads or content violate our policies and disable them quickly. We employ automated filters that continuously identify policy issues, clean, and defend our ad systems. And we consider user feedback when people report sites and ads that they believe may be in violation of our policies. Technology helps us spot potential violations, but our talented reviewers and interdisciplinary team also work to enforce policies. When we review advertisers’ ads, we review everything from the ad creative to the landing page. For publishers, we evaluate elements including traffic patterns on the site and whether the content is appropriate to be monetized. Our teams are constantly reviewing because a publisher or an advertiser who is compliant with our policies today may not be tomorrow. 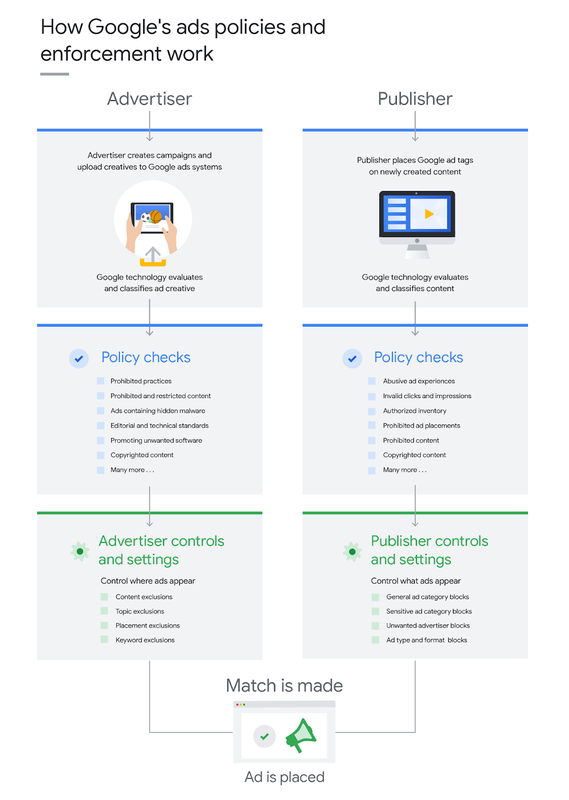 In addition to evaluating ads and sites for policy compliance, we provide advertisers controls they need to manage where and when their ads appear, and provide publishers the ability to control the type and format of ads appearing next to their content. For example, an advertiser of an extreme sporting event may use a Digital Content Label, the film-rating style control for maturity level, to place their ads alongside content suitable specific audiences. Advertisers can couple these controls with placement exclusions, which allow advertisers to specify publishers, apps, or videos to avoid in their campaigns. Maintaining the health of our ad network is key to supporting the ecosystem of creators, publishers and advertisers that rely on Google ads to build their businesses. 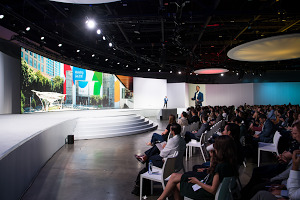 That’s why our teams are committed to refining our policies and fine-tuning our systems and controls to make sure Google ads work for everyone.